Celebrate Moon Festival in Taiwan – Part 1 ? As we learned in Part 1, during Moon Festival people usually eat mooncakes, pomelos and barbecue in Taiwan according to the tradition. However, don’t just focus on the food (despite the fact that they are really delicious)! Let’s learn more interesting facts and stories about them! The history of eating mooncakes can be traced back to Tang Dynasty (618 A.D.-907 A.D.) since it was firstly found in the literature of that era. The historical record pointed out that the tradition was originally from the palace and then gradually spread to the folk. The name “mooncake” made its first appearance in Song Dynasty (960 A.D.-1279 A.D.). History has it that in the earlier time mooncakes weren’t like what we know nowadays. The shape is changed to be round since it symbolizes reunion, completeness and goodness. Legend has it that during Yuan Dynasty (1271 A.D.-1368 A.D.), Han people suffered from the government of Mongolia (Yuan was actually a dynasty established by Mongolia). They had been planning for the revolution against Mongolia. However, since Mongolia heavily guarded and monitored them, it was difficult to communicate and inform of one another about the rebel action. Mooncakes not only played an important role in the history of China, but also became a favourable snack nowadays, which always has plenty flavours for customers to choose from. 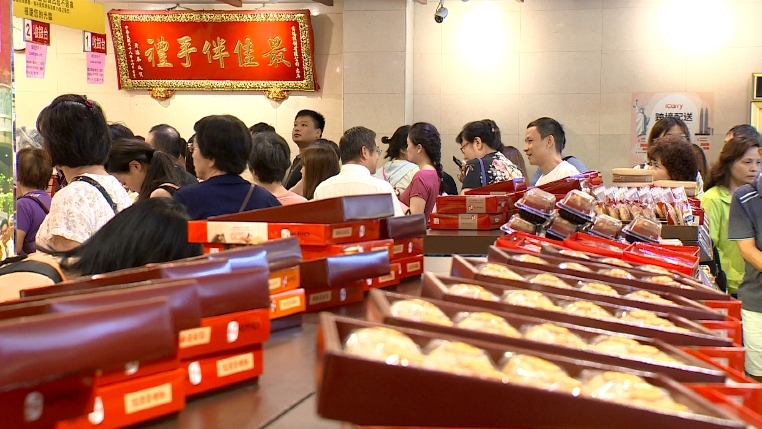 You can buy mooncakes in stores specialised in making gift-style variations or simply normal bakeries during the festival period (they also make numerous to sell). You can even see people waiting in line if the brand is really famous. Three of the most common and popular flavours are 綠豆椪 lǜdòu pèng, 蛋黃酥 dànhuáng sū and 芋頭酥 yùtou sū. This kind of mooncake has a sweet stuffing made of green beans. Sometimes you can also find it with pork filling at the same time. A sweet-salty kind of mooncake, which has red bean paste and a complete salty yolk of duck egg inside as the stuffing. 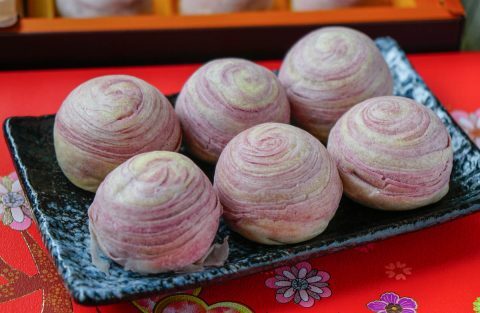 It has spiral-pattern purple skin and sweet filling made of taro. 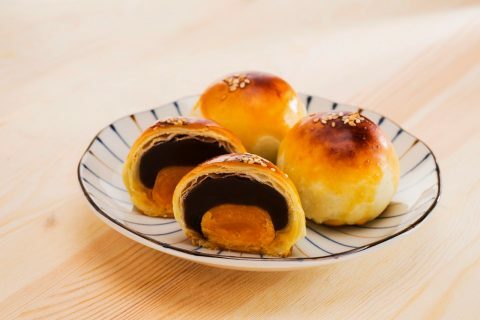 This kind of snacks, which made its first appearance in Taichung City, doesn’t belong the category of “traditional mooncakes”. 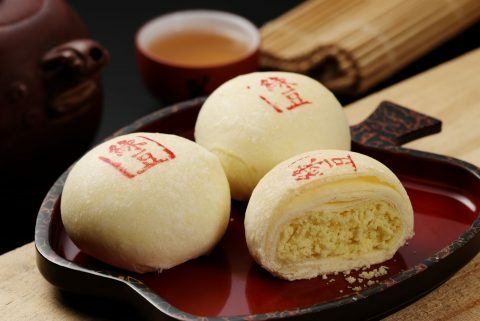 Nevertheless, it’s one of the most popular Taiwanese cakes and has become one of the most favorable choices during Moon Festival. Apart from mooncakes, pomelos are the most-eaten fruit for this festival as well. 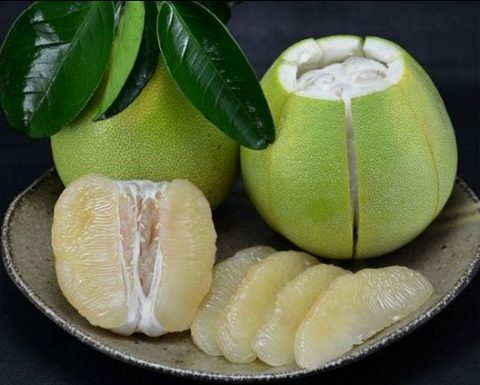 Except the reason that pomelos are in season during this period, its name 柚子 yòuzi also sounds like 佑子 yòuzǐ, which means “blessing children”, is considered a auspicious symbol. The most common varieties of pomelo in Taiwan are 文旦 wéndàn, 西施柚 xīshī yòu and 白柚 bái yòu. Among them, the most popular one is 文旦 wéndàn, which 麻豆 Mádòu District of Tainan City is famous for. First, cut off the top part of the fruit with knife. Second, use knife to make scratches starting from the bottom of the fruit. Third, peel the fruit like peeling a banana. Divide the fruit in pieces like eating an orange but remember the thin and transparent membrane between each piece is uneatable. Apart from enjoying the fruit, children usually take the left pomelo peel as hats. This is a common memory from Taiwanese childhood for many children! 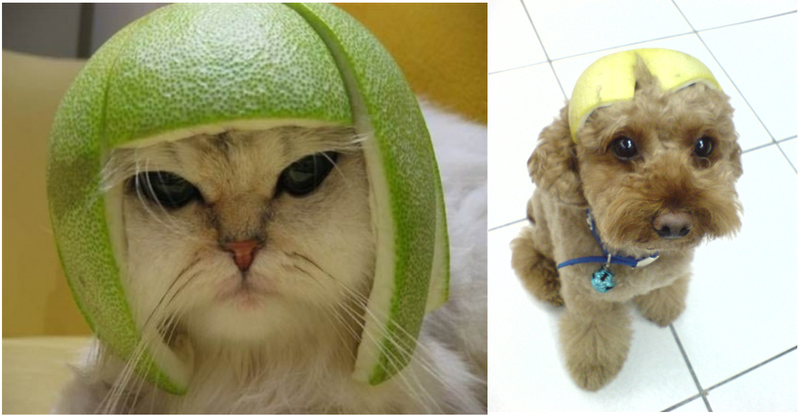 The hat made of pomelo peel is not only for kids but also for….those pets absolutely! 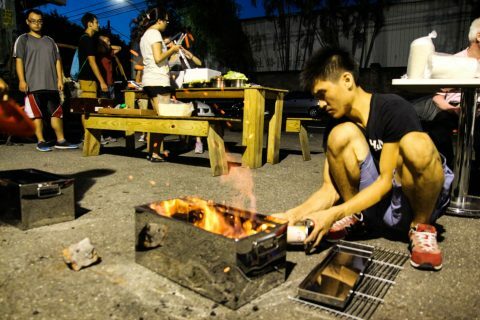 Taiwanese people like to barbecue in the evening of Moon Festival. 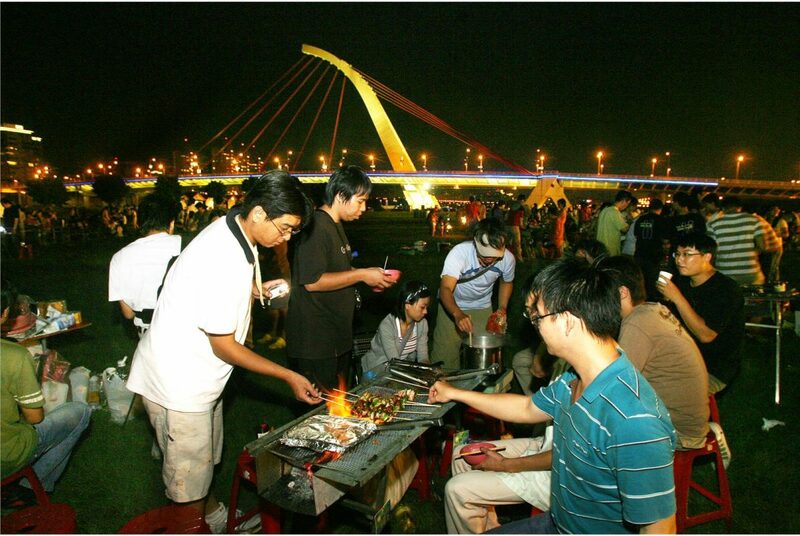 Despite other traditional food, it’s especially curious that only barbecue stands out among all and even gives Moon Festival the nickname “Barbecue Festival”. Actually there are various versions about the origin of this custom. Among them, the most accepted reason is that it should thank the barbecue sauce advertisement during 1980s. 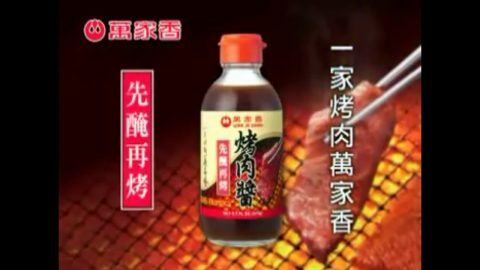 One soy sauce factory firstly combined soy sauce with the idea of barbecue and released the TV advertisement during Moon Festival. One of the most famous lines of the commercial is 一家烤肉萬家香 Yì jiā kǎoròu wàn jiā xiāng. It literally means: one family barbecues, ten thousand families smell good. Since it’s almost autumn, the weather is getting cooler. It has started to be suitable for camping, which is usually related to BBQ. As a result, some say that people just want to do the three activities – camping, watching the moon and BBQ, simultaneously. Another believable version points out that this firstly became a trend in Hsin Chu region, which was famous for its BBQ grill fabrication. During 1980s, export performance had become poor thus the factories began to promote their products domestically. Traditionally every family gather and sit in the yard or in front of the door to watch the moon and chat together. To add a further element of enjoyment to the occasion people came up with the idea of barbecuing at the same time. You’d better make a reservation. If not, you’ll be waiting in line for a long time! 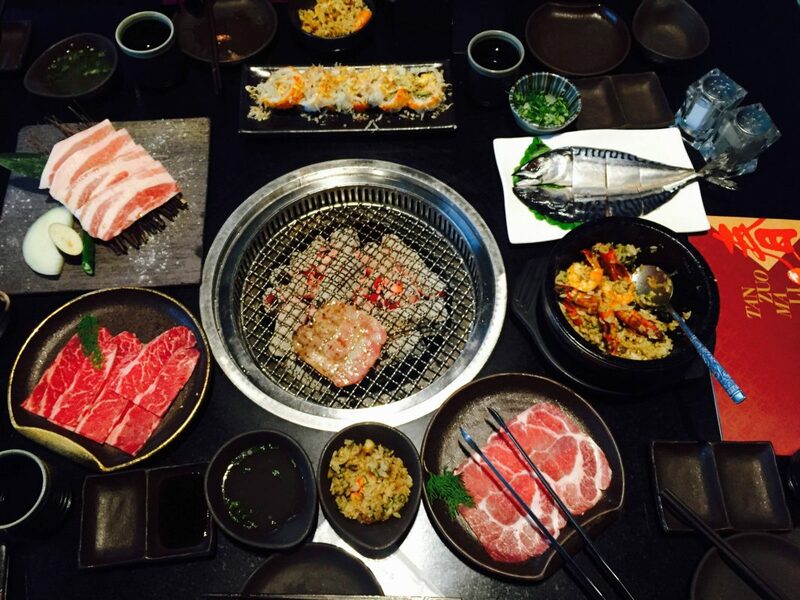 Having BBQ in a barbecue restaurant is also a good choice. 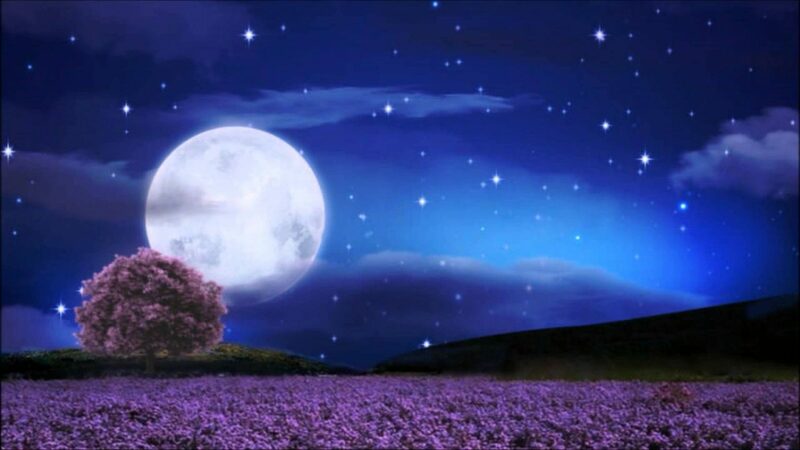 Since we are talking about Moon Festival, let’s just give it a thought…If you are asked to name a Chinese song about “the moon”, what would your answer be? 你問我愛你有多深，我愛你有幾分。You ask how deep I feel for you and how much I love you. Nǐ wèn wǒ ài nǐ yǒu duō shēn, wǒ ài nǐ yǒu jǐ fēn. 我的情也真，我的愛也真。I’m always true and my love is real. 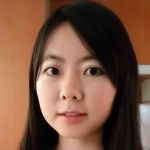 Wǒ de qíng yě zhēn, wǒ de ài yě zhēn. 月亮代表我的心。The moon represents my heart. 我的情不移，我的愛不變。I won’t ever change, my love will be the same. Wǒ de qíng bù yí, wǒ de ài bù biàn. 輕輕的一個吻，已經打動我的心。Sweet with a gentle kiss, you have truly won my heart. 深深的一段情，叫我思念到如今。All things and times we shared, I remember till this day. Shēn shēn de yīduàn qíng, jiào wǒ sīniàn dào rújīn. 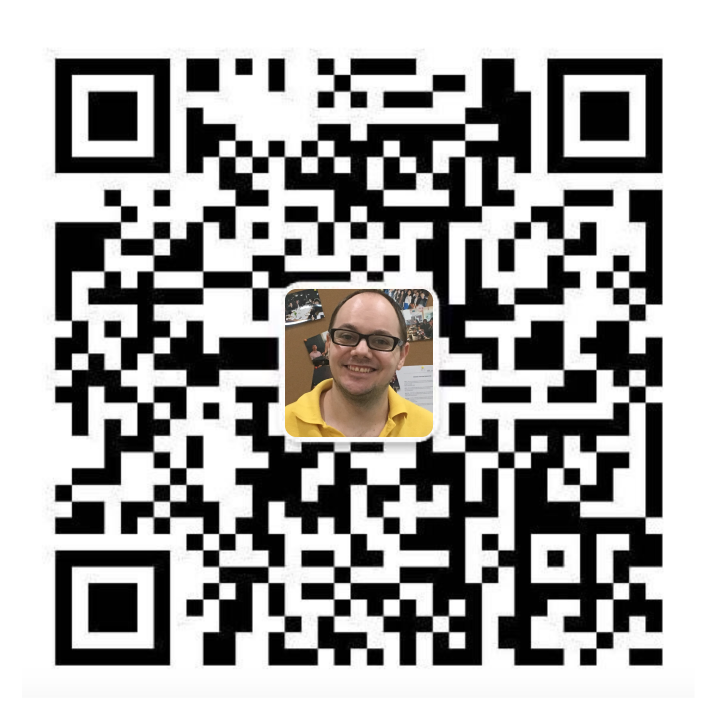 你去想一想，你去看一看。You can think of me, maybe you will see. Nǐ qù xiǎng yī xiǎng, nǐ qù kàn yī kàn. Finally on behalf of LTL, I would like to wish everyone a meaningful, special and romantic Moon Festival!